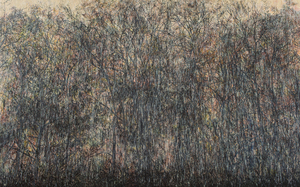 Heo Suyoung’s process of accumulating and overlapping the landscapes in one canvas is initially a record of memory, not an extrapolation of a subject. 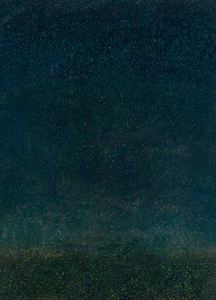 But its beginning drives from transferring realistic scenery onto a canvas, and is based on a lucid reality. It is not an exaggeration to say that in perspective of medium, it follows the traditional Western Modernism, which is based on the easiness of everydayness and accessibility. However, when observed closely, Heo Suyoung’s works exceeds the reproduction of images and recording, and foreshadows the things that exist and are extinct. Ultimately, his works refer the process of seeking the essence of a being after the reality has vanished. 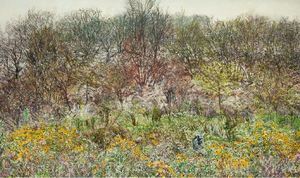 It may be hard to grasp due to the intense visual, texture, and the meticulous detail, but the artist is not just painting ordinary scenery, rather, he is trying to embody the vision of ‘difference’ that alters through seasons, and the sensible narrative of subtle yet clear distinction. Heo’s works, which endlessly flowing time that comprehend color, form, and texture is an absolute formative element, exceed reproduction and approach sensible expression through abundant layers of overlap and accumulation. The outcome of this, which overlaps time and space, creates geography of the physical gap in between multiple layers, and the flatness compressing the inherent narrative. In other words, each image taken from the everyday scenes does not disregard the innate form and colors, but through Heo’s methodology, the original content dissolves and a new image is created, and time and space seeps into that new image. Of course, the imagery (the landscapes or the images from the encyclopedia) that consist of multiple layers or gradually continue on itself (as if in an illustration book, its reader cannot predict the contents of the upcoming page, therefore unintentionally inducing concentration. However, an artificial planning is ruled out), can be interpreted as inherent in constant malerisch role by restoring memories under ‘collection of process’ and reproducing the familiar realism that has been preserved before becoming faint. In another perspective, the ‘collection of process’ is a continuation of things that must be conveyed and the things that could not. 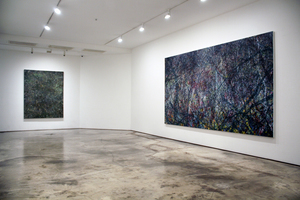 The Yangsandong series (2013) is close in range with the artist’s present works, in which the artist records the whole year of Yangsandong in one canvas. 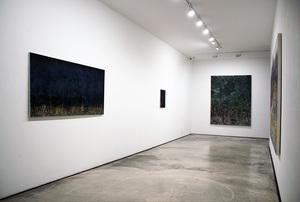 Although this series may be less fantastical than Aquarium and Pondfish (2011), it led the artist into his new ways of working, which combines the new spatiality and temporality from cohering the physical regime (spring, summer, autumn, winter) into one scenery. This process continued on afterwards. The artist introduced the Sanyangri series (2014) in Gallery 175 (2014), and Forest series (2015) in SeMA Nanji Art Studio (2015) and Space K (2015). In the SeMA Nanji Art Show, the artist presented the series Forest (2015) and Garden (2016). The works mentioned above all have one thing in common; even though they each depict a specific place, they all have overlapped layers of time. 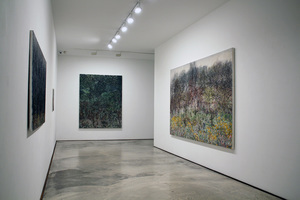 As Dieter Roth revealed the ‘liberty of giving inspiration,’ with the process of categorizing, sequencing, and organizing, in his video installation, Solo Scenes (1997-98), one can sense the identical idea of embodying the stratum of implied time by cross-repetitively overlapping the natural objects (tangled plants, coiled vines, and small twigs, insects and fish) and scenery. Although it may not be the artist’s intentions, his works twist the general concepts. It shows that an environment or object is recognized as a particular concept, but it is actually materialized as a subject on top of an extensive connection, and when it escapes that category, it is not a subject anymore, but something else. Therefore, the artist’s non-obsessiveness reveals the things that cannot be obsessed over in the first place, and falsely idolized and realized as an existence. In other words, the ‘essence’ is in fact ‘naught,’ and that ‘naught’ is not fixated, and it replaces the attempt to break away by transforming or intensified obsession. Another important point is that the artist’s paintings exist in the territory where the distinction of the original is impossible due to the overlapping and layers of time and space. 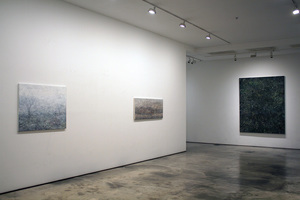 In other words, the artist’s long cumulated brush strokes repeats the multidimensional temporality, the diluted visibility through the temporality, the derangement of reality and image, the gap between the time interchanged with vestige, the image that existed in the special memories and the sharing of public memory through the spatiotemporal collage made of the artist’s sensible experience. This signifies the conceptually flattening of the landscape. Aesthetically, this signifies the visually imprinted object that strongly intersects with the vestige of time, and the inclusion of the process of overturning the visually verified physical environment. It also signifies that the subject without origin, lost in the circulation of time, operate as a new original through the artist’s paintings. Of course, what is left in between the two is again, the balance and plane of time and space. An interesting point lays on the fact that it is hard to understand the ideas listed above by only looking at the artist’s painting’s externality. 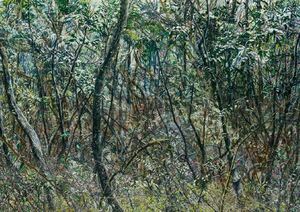 It is likely to assume that his paintings just embody an intentional camouflage of an environment. But Heo’s paintings contain the memory and vestige that are piled up as if they were always there, the existence of the object encompassing the existing material, color, and form, and the time and space that imply the existence. Heo Suyoung’s works recreate the function of reproduction through the trace of subjective fabrication and process on top of an objective depiction, and materialize the characteristic features by joining the visible substance and layers of time. However, the artist intervene his own visions and the variation of space into his works, to alternate art through the flatness of painting. 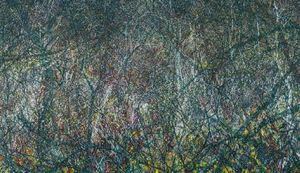 This clearly shows the steps of a painting ‘becoming art on its own,’ and in this perspective, Heo’s works are not imitating what the artist sees, but emphasizes the epistemology of something that cannot be seen, on top of visualizing it. Today, his works deviate from the standard archetype by its uniqueness, and endlessly cycles (like the four seasons) under the reality and fiction, the eye and object, the ‘record’ as reproduction as well as an understanding. This process is created from the artist’s intuition; an unintended process. The artist says, “I don’t make an elaborate plan when I paint. I move my hands and paint, which eventually leads to the direction and method of the painting. I don’t want to apply a ‘plausible’ reason or objective, but paint as if I’m drifting.” This statement lingers on, and presents the patience and affection of the artist, who uses his emotions instead of his mind. Although one cannot fully understand this, one can sense the emotional flow in the paintings.